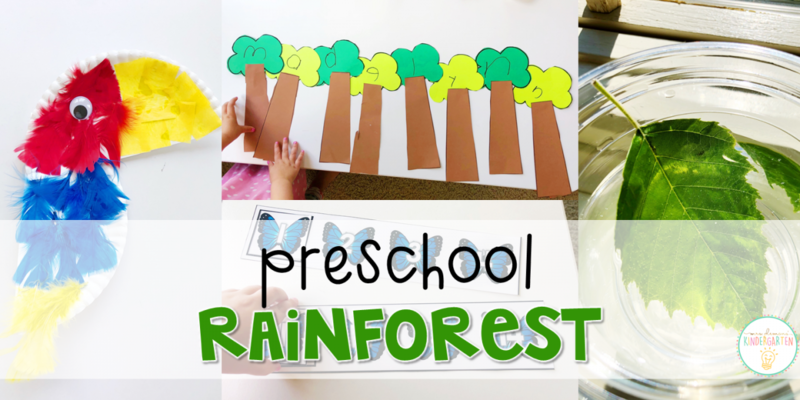 This week was all about monkeys, birds, and butterflies with our Preschool Rainforest theme. 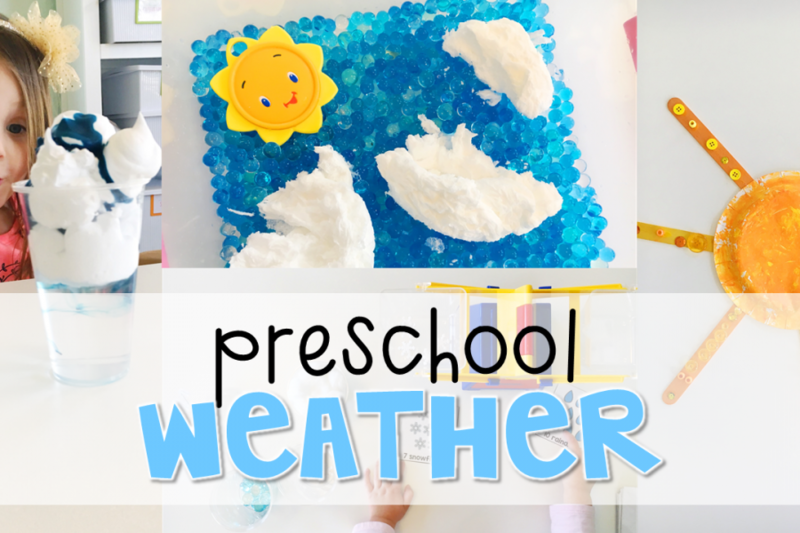 This was a new theme that we didn’t try out in tot school, which made it extra fun to learn and explore! Our first book this week was Over in the Jungle by Marianne Berkes. While reading I used picture cards to reinforce new words. 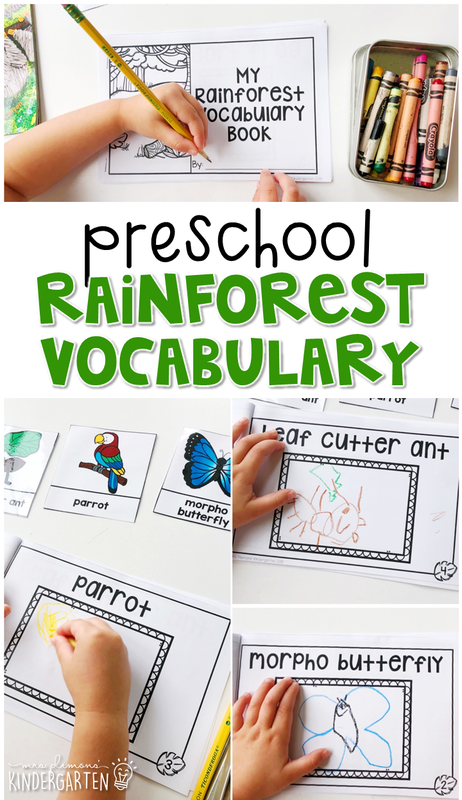 Then Madelynn made a rainforest vocabulary book. 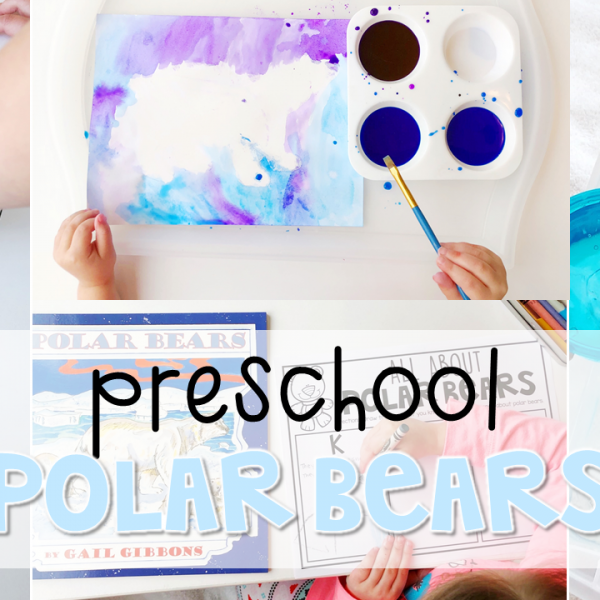 She drew pictures to show each animal and used the picture cards and book as a reference. Our next story was The Great Kapok Tree by Lynne Cherry. Before reading we discussed and defined problem. 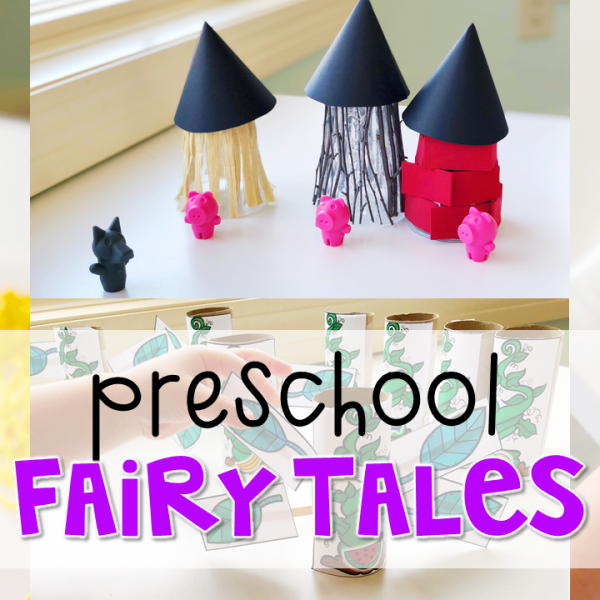 We talked about how every story usually has a problem or something that goes wrong. After reading, Madelynn drew and labeled the problem in the story. 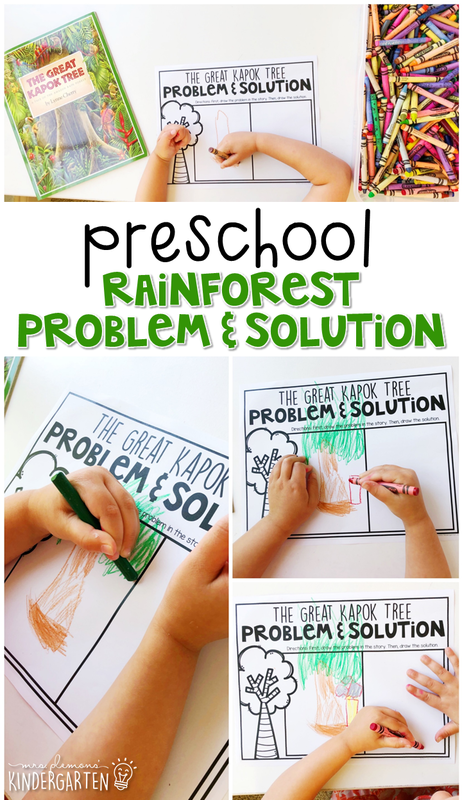 Then we talked about and drew how the problem was solved. 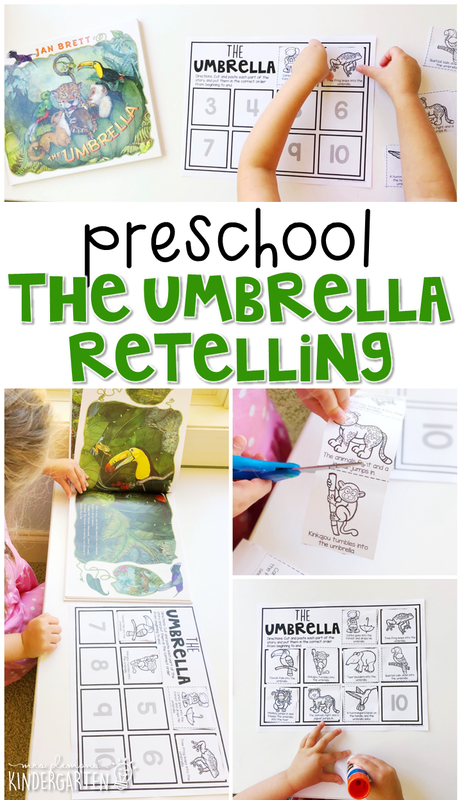 Our next story was from another one of our favorite authors, The Umbrella by Jan Brett. 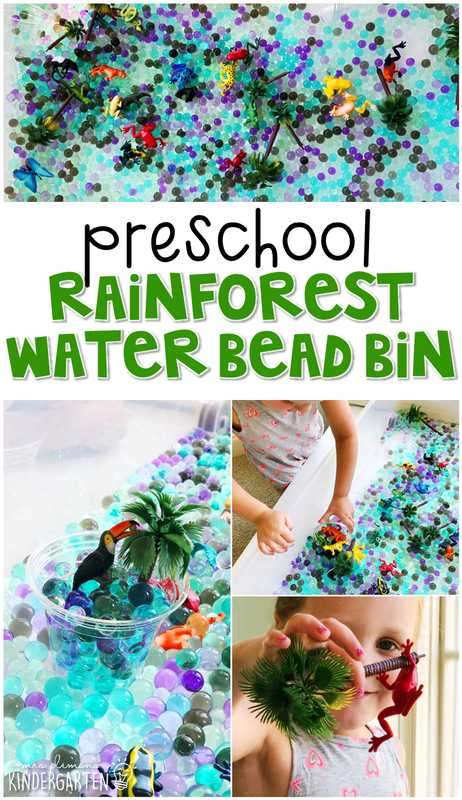 We loved that this story was very similar to The Mitten, just with a rainforest theme. After reading I gave Madelynn 10 pictures from the story with simple sentences underneath. 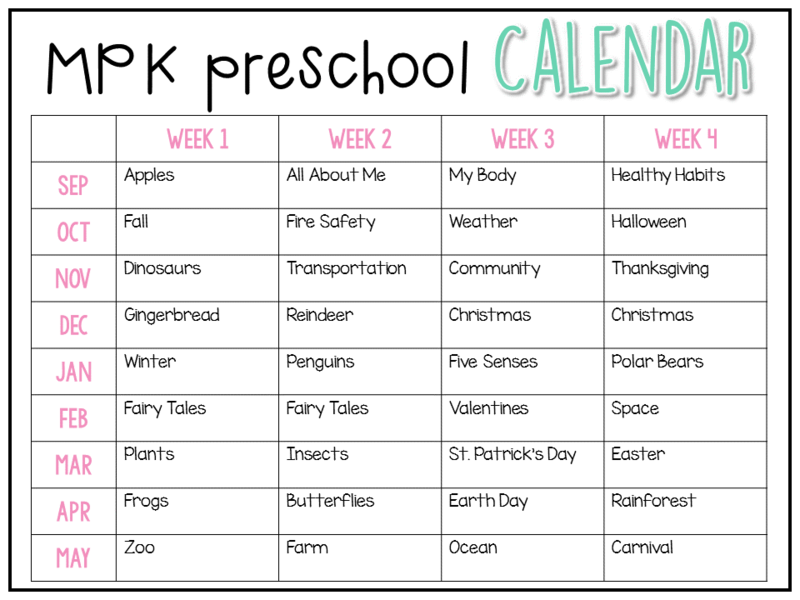 We read through them all together and then I prompted her to find what happened first, second, third, etc. She then glued them to her page in the correct order to retell the story. I kept the book nearby so she could check the pages if she was stuck, and it was also an easy way to double check her work. Our last read aloud was the nonfiction book Rainforests by Marf Ferguson Delano. 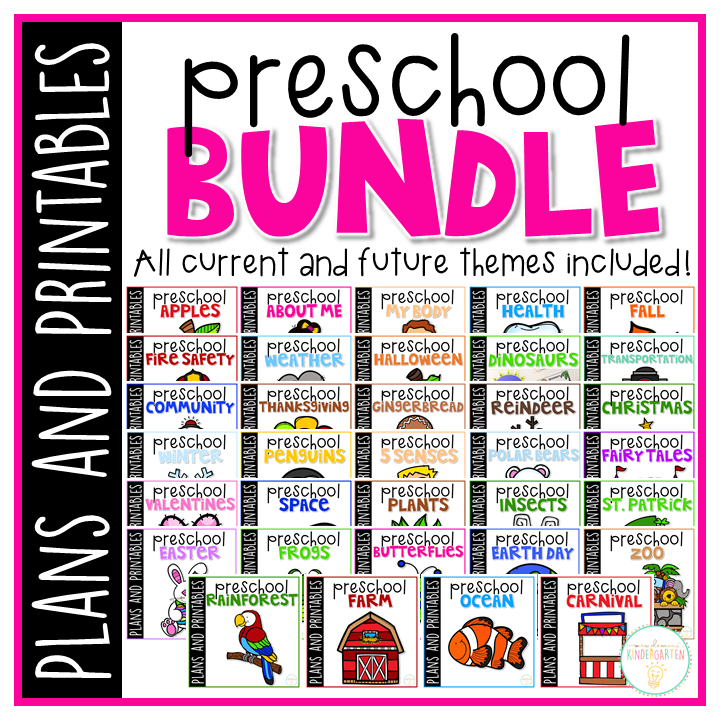 National Geographic Kids books never disappoint when it comes to providing quality engaging nonfiction books. 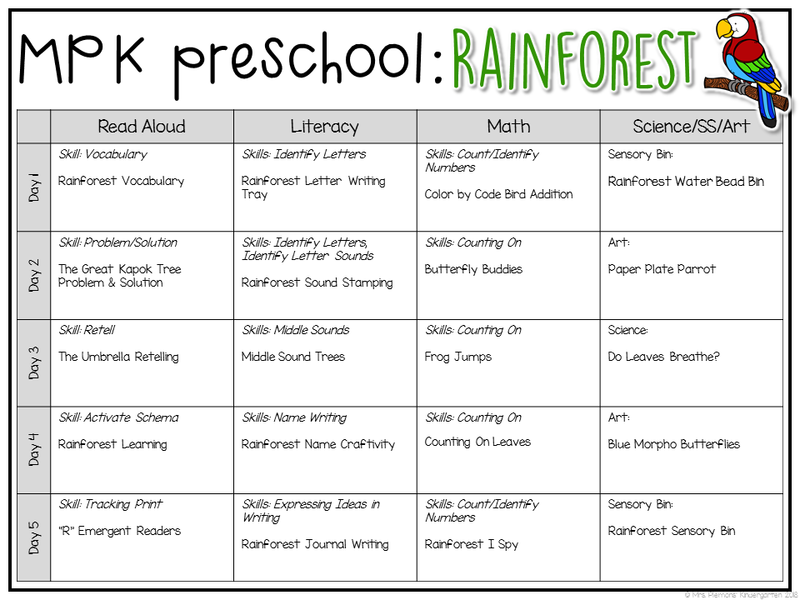 Before reading, we talked about what we already know about the rainforest. Madelynn drew a picture and told me that “Toucans live there..” I helped record her idea on the rainforest KWL chart under “K” for know. 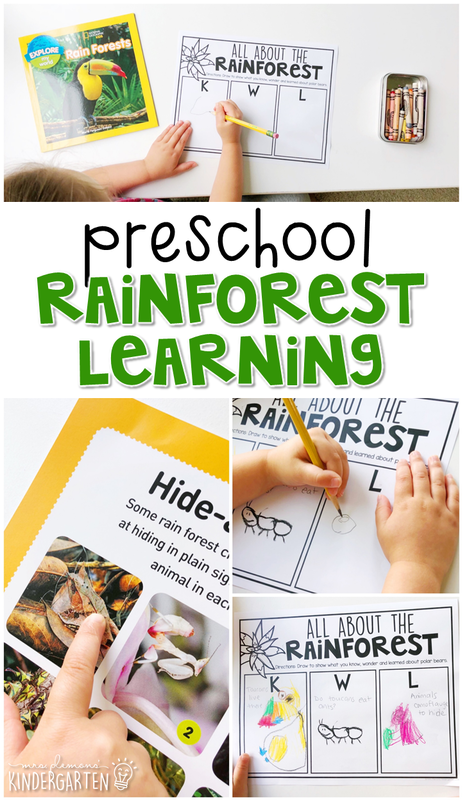 Next we discussed things we want to know about the rainforest. Madelynn drew a picture and asked “do toucans eat ants?” I recorded her question under the “W” for wonder. Finally we read the book and talked about our new learning. Madelynn did not find any information about what toucans eat, but learned how animals camouflage to hide so she drew a picture and I wrote her sentence under the “L” for learned. 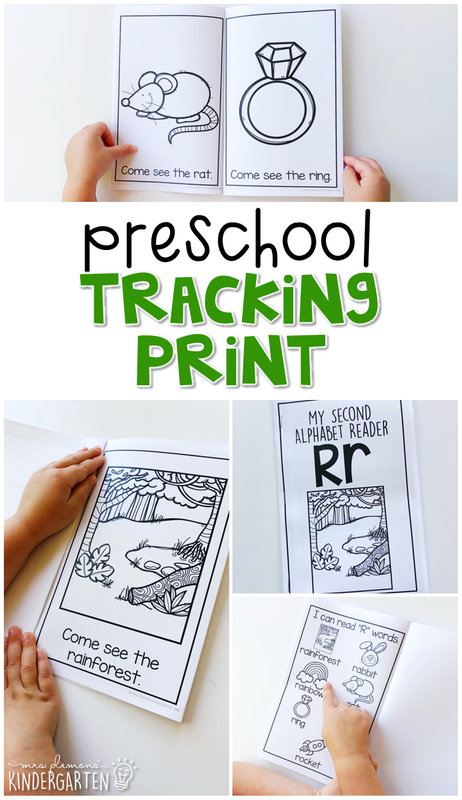 Our last book was this letter R alphabet reader. Madelynn identified the picture then pointed to each word as she read. Afterwards she colored all of the pictures in. 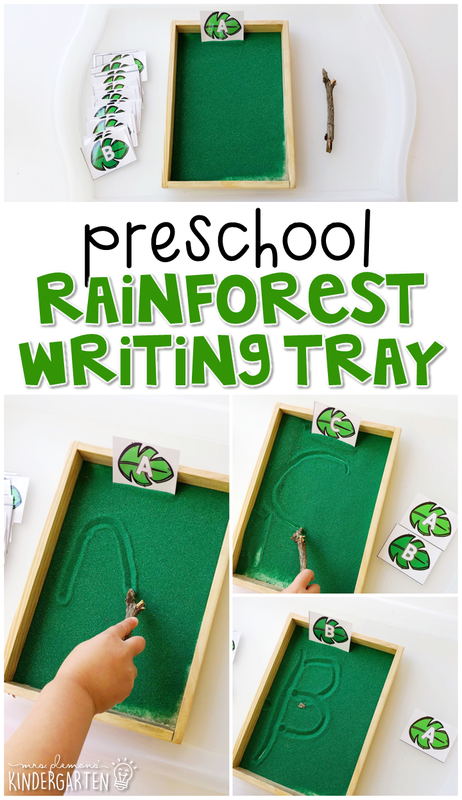 Our first literacy activity this week was a rainforest themed letter writing tray. 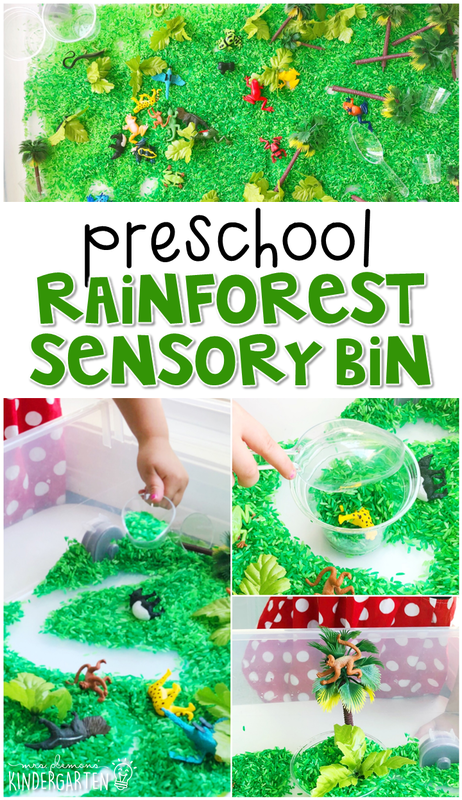 To make this fun sensory activity I filled our tray with green sand and sticks. 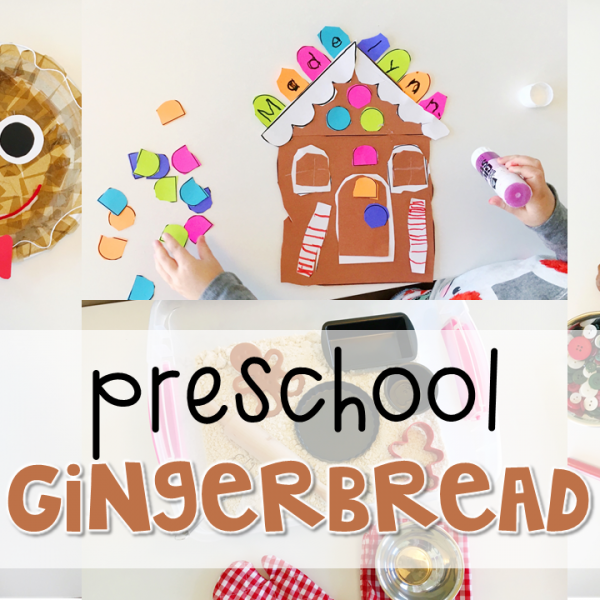 Madelynn used leaf letter cards as a model and chose which ones she wanted to practice. Then she used a stick or her finger to write letters in the sand. Next, for more letter practice we used our dot stampers. 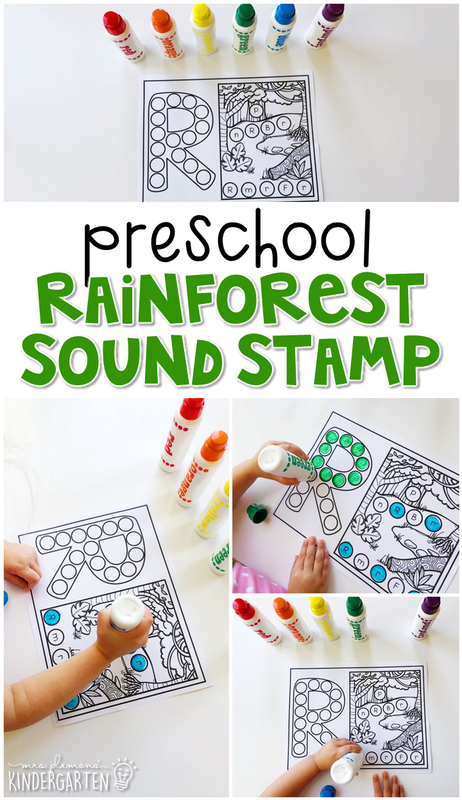 We started out stamping inside the letter to make an R. Then Madelynn had to find the upper and lowercase r’s in the rainforest, stamp them and make the “R” sound each time. Then she stamped the other letters different colors and tried to make the sounds for each one. This week we focused again on identifying the middle sounds in words. Vowel sounds are very tricky for little ones to learn so we will be practicing this skill for a LONG time. 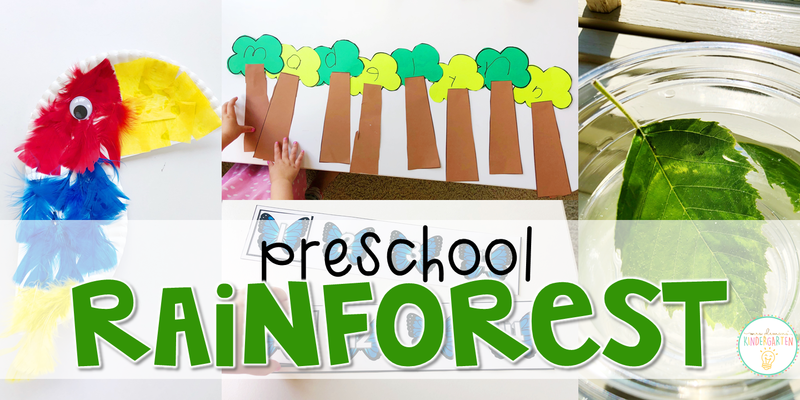 I put together a rainforest of trees with CVC words on the tree tops. 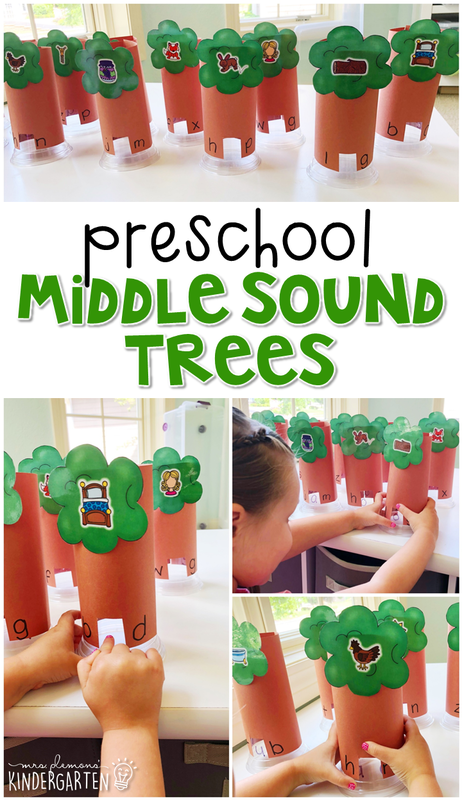 Hiding under each tree was a plastic cup that Madelynn used to rotate through each vowel sound until she found the one that completed each word. 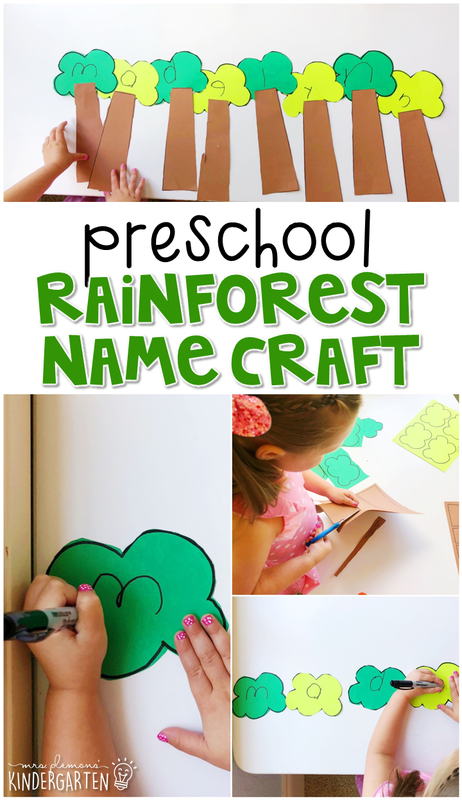 For this week’s name craft we created a rainforest with letter trees. First, Madelynn cut the tree pieces out. Then she wrote the letters in her name on each tree top. After she finished writing, she glued the trunks to each tree top, then glued them together in order to spell her name. 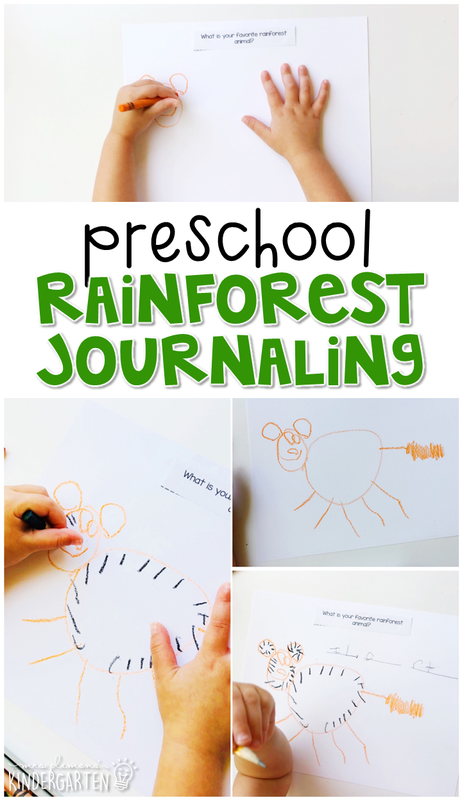 For our journal this week Madelynn chose to draw her favorite rainforest animal. She said “I like tigers.” I drew lines for each word, then we worked on writing the sounds together. 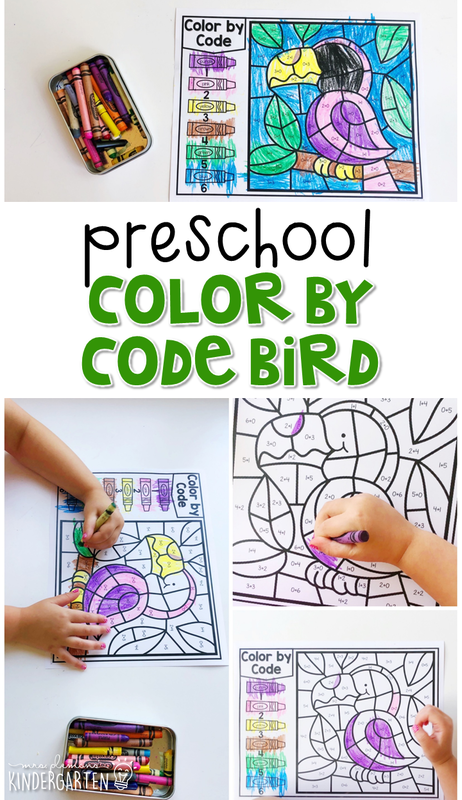 We worked on addition to 5 this week for our color by the code activity. Madelynn solved the number sentence in each section of the picture then used the key to color each one the correct color. Our other math focus this week was counting on from a given number. First we completed number sequences with butterfly cards. 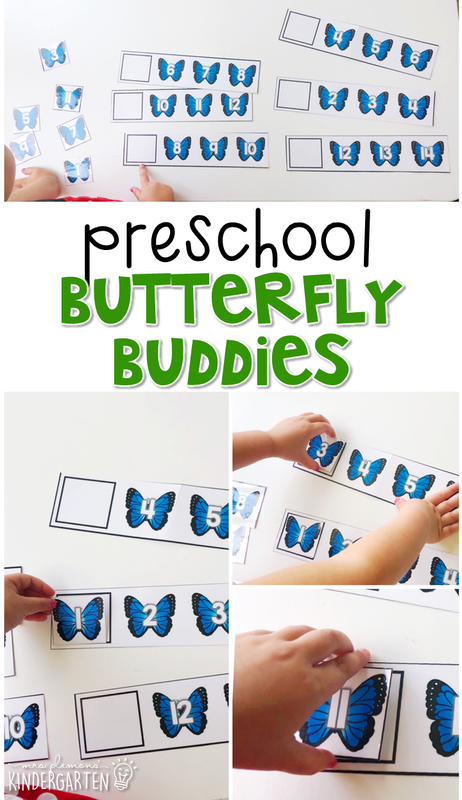 Madelynn chose one of the single butterflies and matched it to the correct sequence of butterfly buddies to practice counting on. 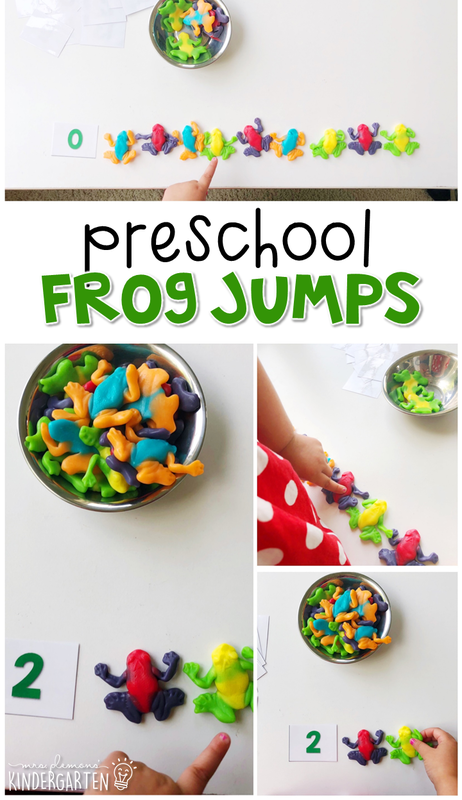 For a special treat, we added gummy frogs to our counting on practice for this frog jump activity. First, Madelynn chose a number card. Then she grabbed a small handful of gummy frogs. Starting at the number on the card chosen, she practiced counting each of the gummy frogs to practice counting on. 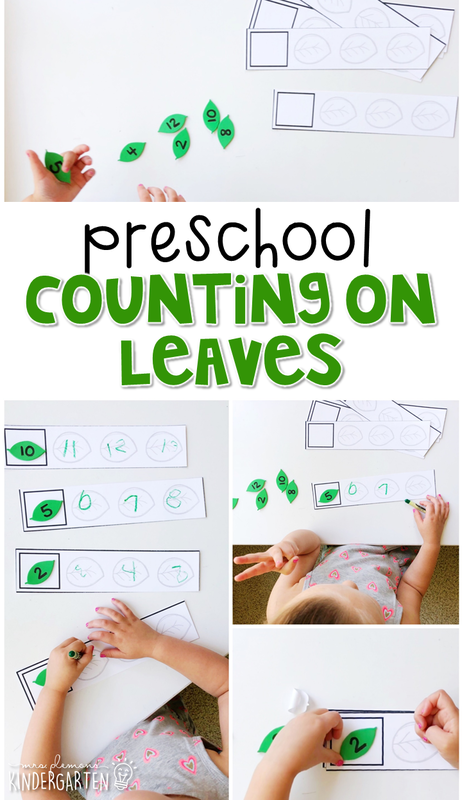 For our last counting on practice activity we used leaves. First Madelynn chose a foam leaf sticker (with number written on it). She stuck it in the first box of a leaf strip. Then starting at that number, she counted on, and wrote the next 3 numbers in the sequence. For our last math activity we did a little extra counting practice. 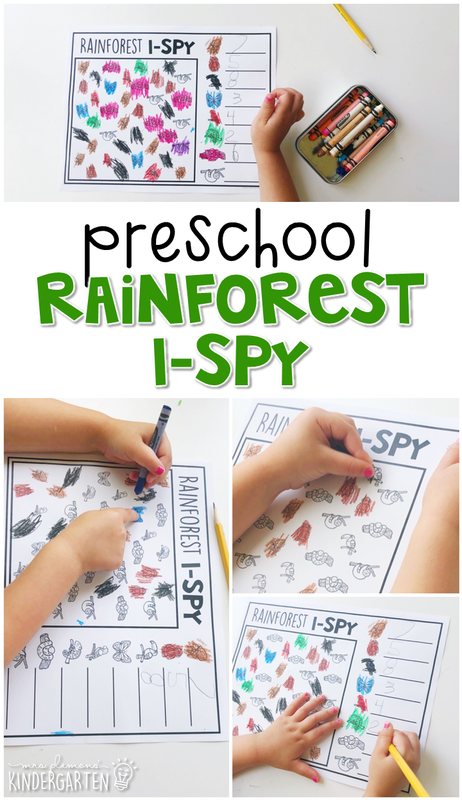 I printed this rainforest I-spy page and Madelynn had to color and count each of the rainforest animals. Then she wrote the number of each animal next to its picture on the right side of the page. 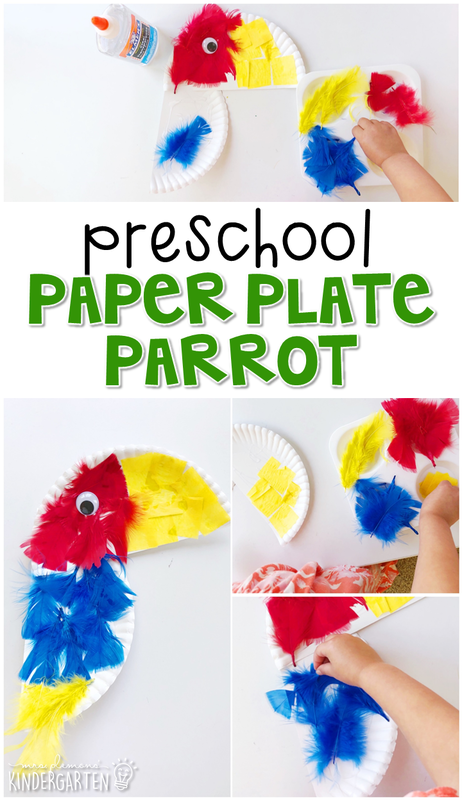 Our first craft this week was an adorable feathery tropical bird. First we cut a paper plate in half. I used hot glue to glue one half to the other to form a head and body. Madelynn used yellow tissue paper squares to cover the front half of the head for the beak. Then she glued red, yellow and blue feathers to cover the rest of the head and body. 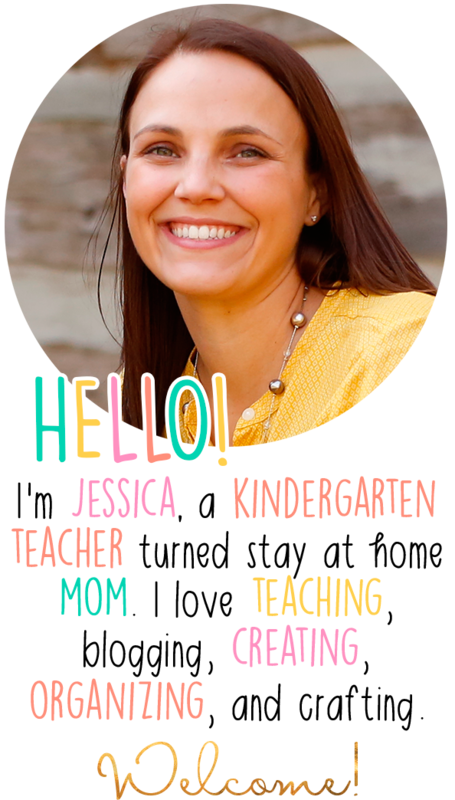 Finally she added a large googly eye to the head to complete her project! For science this week we discussed properties of plants. 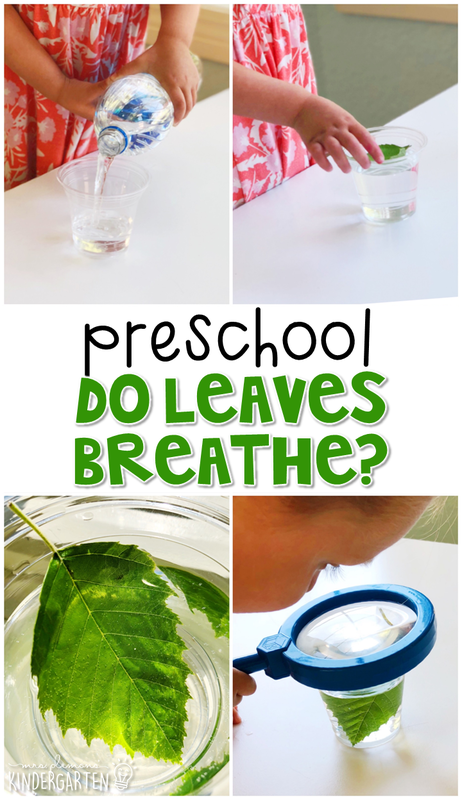 Then we conducted a little investigation to see how leaves breathe. We filled a clear plastic cup with water. Then we went outside and pulled a leaf off of a tree. 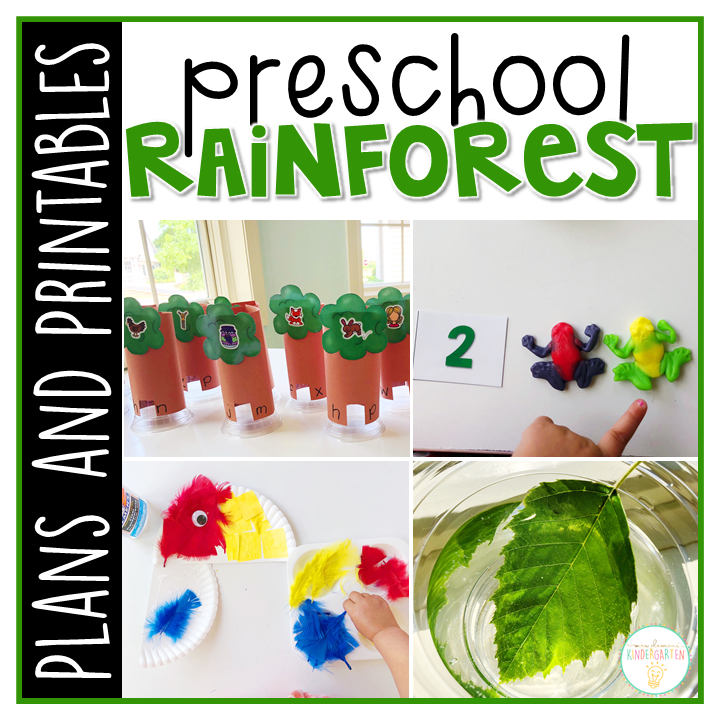 Then we placed the leaf in the cup and pushed it under the water. Next we placed it in a very warm sunny window. We wait about hour (you could always wait longer more), then we took a close look at the leaf using a magnifying glass to look more closely at the bubbles forming on the leaf. For our second craft, we created beautiful blue morpho butterflies. We looked at LOTS of pictures of blue morpho butterflies in our rainforest books first to study their patterns. Ahead of time, I cut a large “v” out of the top of a paper plate, and a smaller “v” out of the bottom of the same paper plate. 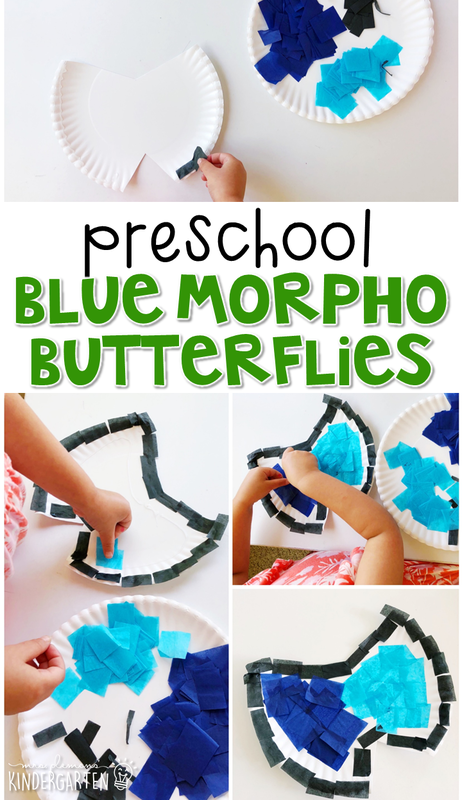 Madelynn glued black and blue tissue paper squares to the paper plate to create a blue morpho butterfly.